It’s time for sun, sand and plenty of celebrating! Your father-in-law is turning another year older and you want to give him a great birthday surprise. This card is the perfect choice. 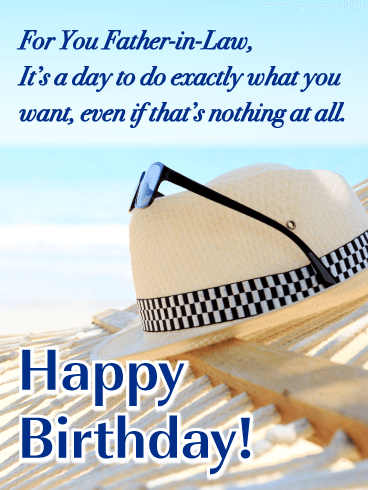 With a beach hat, sunglasses and a hammock, it will let him know that it’s a day for sitting back and relaxing as he basks in all of the wishes from the people who love him most. For You Father-in-Law, It’s a day to do exactly what you want, even if that’s nothing at all. Happy Birthday! 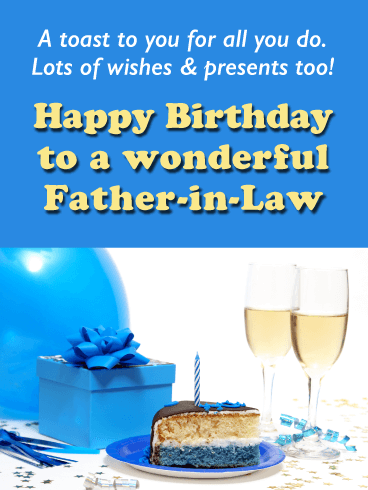 A special father-in-law deserves a special greeting on his birthday. This card is it! A piece of cake topped with a single candle, a gift box, balloon and two glasses of champagne all come together, creating the perfect combination for a celebration he’ll never forget. It’s a great way to toast him for all that he does. A nicely wrapped blue gift box with a big silver bow around it makes a wonderful surprise for a father-in-law who means a lot to you. It’s a reminder that having him in your family is the very best gift you can ask for. This thoughtful card will make him feel remembered as he celebrates his special day. A sandy beach. A sunshine-filled day. And colorful party favors. What better way to set the scene for a blissful birthday! And it's all in honor of your awesome father-in-law. 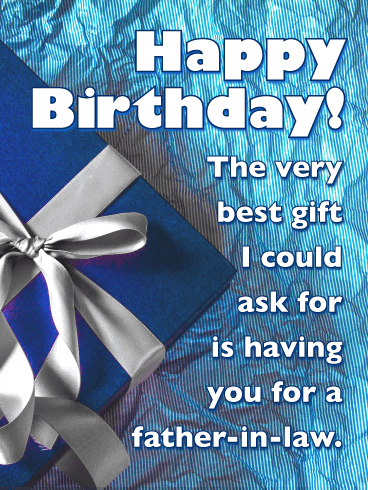 This cool birthday card is sure to put him in the mood for a party, while reminding him how much he means to you. 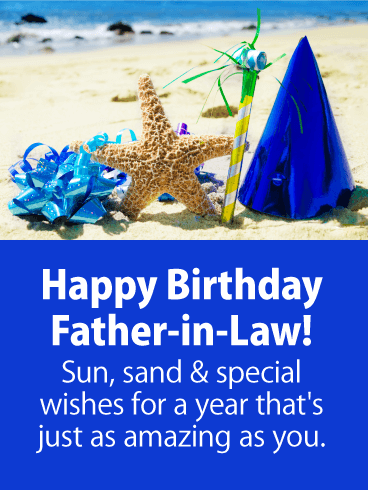 So whether he's a beach lover or just loves relaxing, give him a reason to soak up all the fun and celebrate on this special occasion! On a day as special as this, only a special card will do. 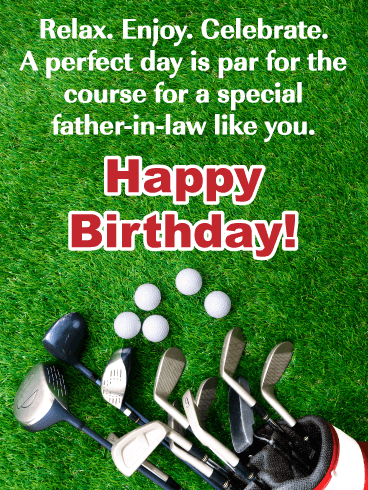 Wish your father-in-law a happy birthday with this thoughtful, golf-themed card to help him celebrate! A sunny, blue sky above shines down on a set of clubs, the perfect setting for a day of relaxing. And the message will let him know that you're hoping he enjoys every moment doing what he loves, golf or otherwise! 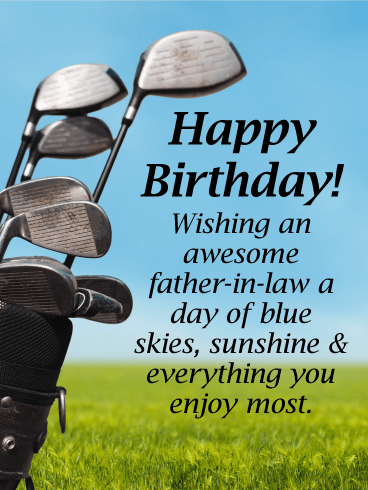 Whether he’s a golf lover or just enjoys a nice, relaxing afternoon, this birthday card for your father-in-law is a great way to help him celebrate! A set of golf clubs and balls decorate the bottom, set against a lush green course. It’s a reminder to stop and enjoy every moment while letting him know how special he is to so many people, especially you! Cheers to the very best father-in-law around! 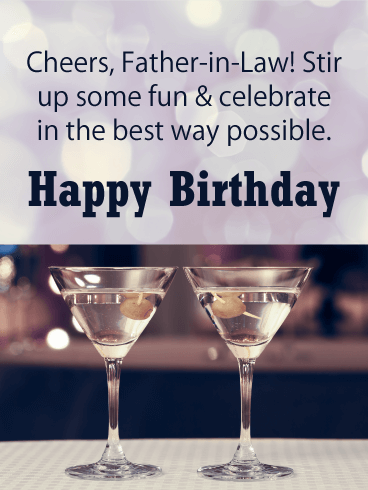 This fun birthday card lets you raise a toast to him in style, while reminding him to stir up lots of fun and celebrate in the best way possible. Whether it's relaxing solo with his favorite cocktail or throwing a big party surrounded by family & friends, this day is all about him and should be enjoyed to the fullest! 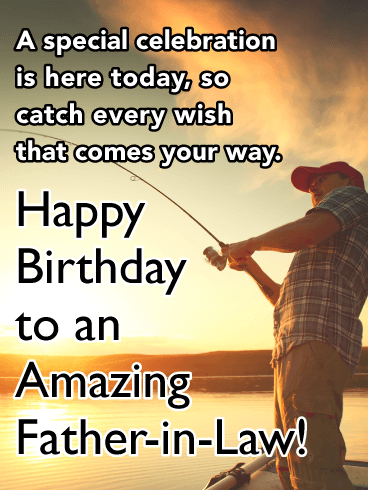 It’s a special day to celebrate your father-in-law, and you want him to catch every wish that comes his way. This card will help him do just that! The scene of someone spending some relaxing time fishing as the sun goes down, casting his pole into the water, is a reminder for him to slow down and enjoy his celebration in the best way he knows how. 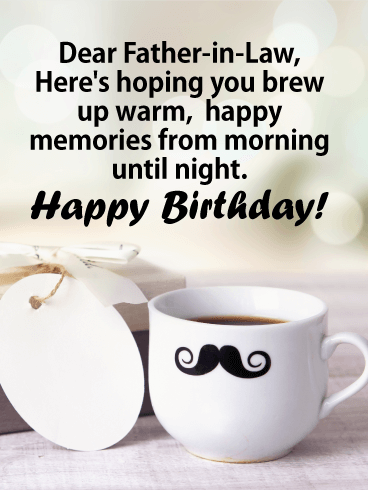 A fun, mustache coffee cup sits next to a gift box, waiting to perk up your father-in-law-s birthday in the best way possible! Both fun and endearing, this birthday card will definitely make him feel warm all over knowing you took the time to think of him and wish him well. And the words are bound to brew up some extra happiness from morning 'til night! 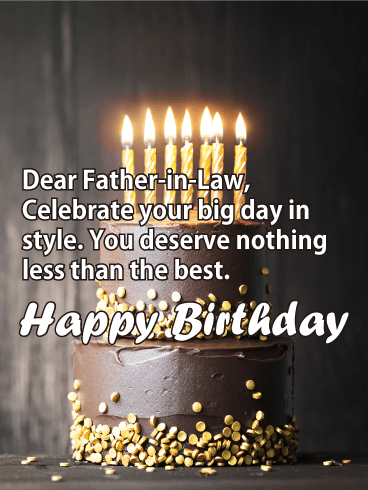 For a father-in-law who's got lots of style and class, this charming birthday card is sure to leave him smiling bright! A tuxedo-themed cake is simply perfect for celebrating his big day, while reminding him just how dapper he is. And the message above lets him know that he deserves nothing less than the best, today and every day. 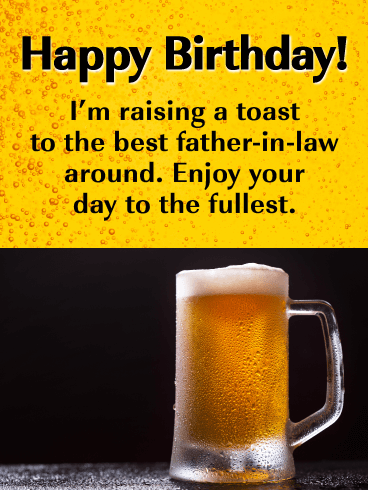 This birthday card for your father-in-law will brew up some fun and good times for sure! An ice cold beer is waiting to be enjoyed over lots of laughter and celebrating for someone who means so much to so many people. It’s also a great reminder to enjoy his day to the fullest! 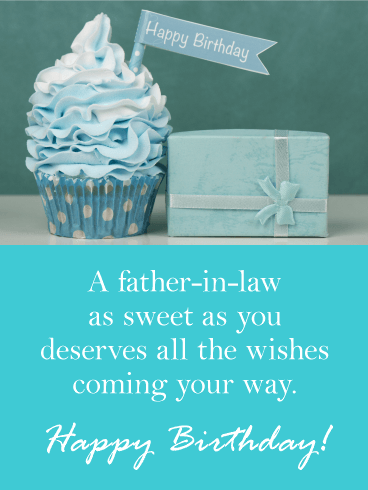 Got a sweet father-in-law celebrating a birthday? This charming birthday card is the perfect pick to make him smile! A cupcake loaded with blue & white frosting sits next to a nicely wrapped gift, all ready to help him enjoy a fun-filled day! And the best part is the thoughtful message, letting him know he deserves all the wishes headed his way, both today and in the year ahead. 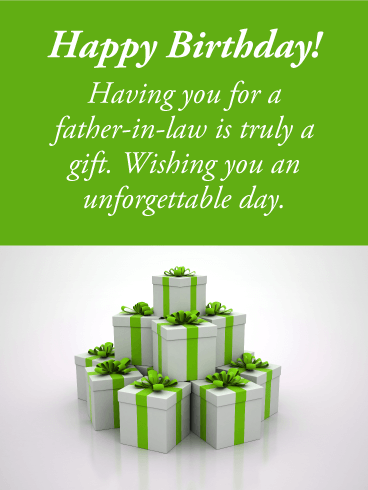 A stack of gifts in white & green are piled high, ready to help celebrate your father-in-law's birthday in the most festive way possible. Above are your kind & caring wishes to someone who is not only a special person in your family, but who is truly a gift to know. This thoughtful greeting is sure to make him feel loved & remembered for a long time to come.